Detecto Run-A-Weigh RW-1000 Portable Platform ScaleCardinal Run-A-Weigh RW-1000 features 1000 pound max capacity and weighs in at less than 100 pounds and features built-in handles and wheels. The RW-1000 is easy to lift and roll to wherever you need it. Whether it's multiple weighing locations at a single facility or the need to take a scale to special job sites, the RW-1000 gives you true portability. Painted steel scale w/ the 204 indicator. Price includes freight in cont'l US. Intercomp CS1500 Crane Scale 2000 lb.Intercomp CS-1500 high performance NTEP certified digital crane scale with 2000 pound max capacity features electronics mounted in a weatherproof cast aluminum case. This assures maximum protection against moisture, dust, and rough usage. High visibility 0.8 inch/20 mm LED digital readout provides easy reading of weights; recessed push button switches allow simple, trouble-free operation. Normal lead time for this product is 2 to 3 weeks. 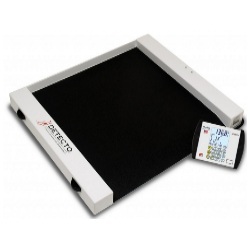 Intercomp CW250 24x24 Portable Floor Scale 2000 lb.Intercomp CW250 24x24 2000 lb. 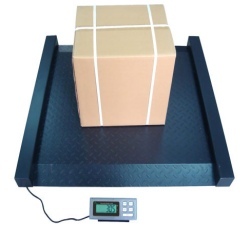 portable floor scale is ideal for weighing tanks, drums, boxes, cylinders, and miscellaneous items. 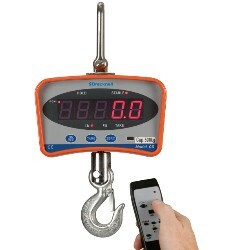 Scale is battery operated (charger adapter and cable provided) Includes infrared remote control. Wheels are optional. NTEP Class III approved. (95-024) Normal lead time for this item is 2 weeks before shipment. 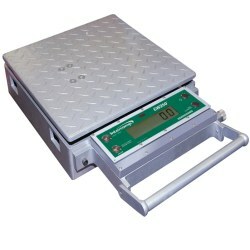 Intercomp CW250 Portable 15x15 Floor Scale 1500 lb.Intercomp CW250 15"x15" 1500 lb. 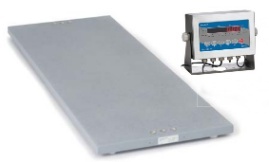 portable floor scale is ideal for weighing tanks, drums, boxes, cylinders, and miscellaneous items. Scale is battery operated (charger adapter and cable provided) This rugged self-contained unit is NTEP Class III approved. (95-024) Normal lead time for this item is 2 weeks before shipment. Intercomp CW250 Portable 15x15 Scale 3000 lb.Intercomp CW250 3000 lb. 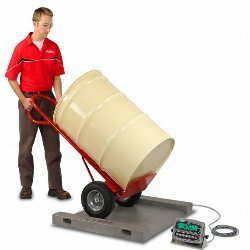 capacity 15"x15" platform scale is ideal for weighing tanks, drums, boxes, cylinders, and miscellaneous items. 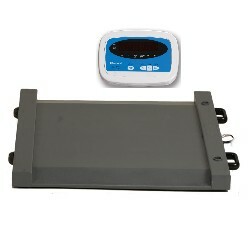 Scale is battery operated (charger adapter and cable provided) This rugged self-contained unit is non ntep. Normal lead time for this item is 2 weeks before shipment. 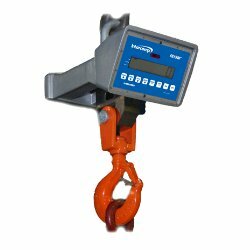 Salter Brecknell CS1000 Crane ScaleSalter Brecknell CS1000 crane scales are versatile, economic solutions for overhead material handling and weighing applications. Features include a rechargeable battery, lifting-duty hardware, bright LED display and sturdy construction. Capacity: 1000 pounds. Salter Brecknell CS2000 Crane ScaleSalter Brecknell crane scales are versatile, economic solutions for overhead material handling and weighing applications. Features include a rechargeable battery, lifting-duty hardware, bright LED display and sturdy construction. Capacity: 2000 pounds. Weighsouth 3x3 NTEP Floor Scale 2500 lbThe Weighsouth 3x3 2500 lb floor scale is heavy duty with a structural steel design to withstand many years of heavy industrial use. NTEP Approved Legal for Trade. Features easy to read LCD display. Capacity 2500 lbs. Price includes freight in cont'l US to business addresses only (Zoned Commercial) with a loading dock or fork-lift. All other charges are the buyers responsibility. (Liftgate, Residential, Construction, Military). 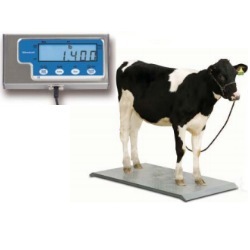 Salter Brecknell PS3000 Equestrian ScalePS3000 provides accurate electronic weighing of larger animals and removes the guesswork for administration of feed and medicine. Capacity is 3000 lb. 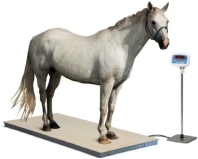 The largest horses average below the capacity limits of this equestrian scale. 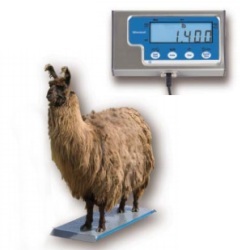 The scale is large enough to avoid making animals skittish while weighing. Please note this scale no longer comes with ramps. Freight Included Cont'l US shipping --Delivered by Motor Freight to business addresses only (Zoned Commercial) with a loading dock or forklift. All other charges are the buyers responsibility. (Liftgate, Residential, Construction, Military) Approx ship weight 250 lbs.